Hamas launched a public relations campaign in recent days, aimed at capitalizing on a deadly truck attack in Jerusalem Sunday that killed four Israeli soldiers. The campaign sheds a light on Hamas's plans to encourage and launch jihadist atrocities, but also on its vulnerability to the arrival of ISIS as an ideology and movement. The truck attacker was Fadi Ahmad Hamdan Qanbar, a father of four from east Jerusalem. He acted alone when he plowed into a cluster of soldiers gathered, according to Israeli assessments, under the influence of jihadist propaganda disseminated by ISIS. That fact has not stopped Hamas from making multiple efforts to claim the attack as its own, celebrating it, and pushing Palestinians to emulate it. The Gazan regime's goal of setting the West Bank alight is well served by such incidents. Yet Hamas's efforts to cash in on the truck ramming also strengthen its domestic challengers in Gaza – ISIS-affiliated Salafi-jihadist groups which have been just as quick to claim Qanbar as one of their own, and probably with better cause. These same groups wasted little time in using the opportunity to launch stinging attacks on the Hamas regime, whose security forces arrest their members and repress their activities. For example, an ISIS-affiliated group in Gaza proudly noted that Israel attributed the attack to one who "belongs to the Islamic Caliphate State," and stated: "Praise Allah, who provided the oppressed people of Bayt Al-Maqdis [Jerusalem] with trucks they can use to run over the settler herds – [and this] instead of the haram [forbidden] organizations [the main Palestinian organizations]." A grim jihadist competition is underway, over who can use the Jerusalem attack to boost its political power. Immediately after Qanbar's attack, Hamas claimed he was an operative of its military wing, the Izz Al-Din Qassam Brigades. 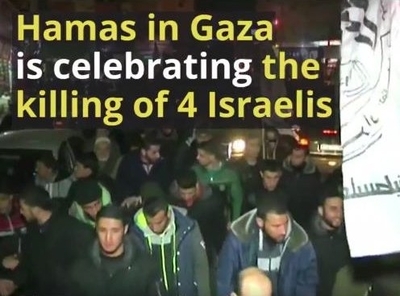 Fathi Hamad, a member of Hamas' political bureau, told a rally in Gaza to celebrate the murders that same night: "the [Israeli] soldiers fled from the Izz al-Din Qassam Brigades operative who carried out the attack for the sake of the Palestinians, the Arab nation and the Muslims." As the Middle East Media Research Institute (MEMRI) noted, Hamas's official Twitter account chimed in: "We welcome the bold and heroic truck operation in Jerusalem which was a natural reaction to the crimes of the Israeli occupation." To be sure, Hamas is engaged in unceasing efforts to set up and launch terror cells in the West Bank and east Jerusalem from where they try to evade Israeli intelligence, infiltrate and commit mass casualty attacks in Israeli cities. Hamas also is a main source of inciting lone Palestinian attackers. Yet it is also in a state of conflict with Gaza-based ISIS entities, which sporadically fire rockets into Israel hoping to provoke retaliatory Israeli airstrikes on Hamas targets. In essence, ISIS-affiliated groups try to use the Israel Air Force to punish Hamas. ISIS views Hamas as an infidel movement due to its willingness to blend jihadist doctrines with Palestinian nationalism. Nationalism has no place in ISIS's vision of a pan-Islamic caliphate, free of so-called artificial national divides among Muslims. Meanwhile, tensions increased as relations between Hamas and the ISIS affiliate Wilyat Al-Sinai (Sinai Province), which once saw a good degree of cooperation, soured. This relationship enabled Hamas to continue smuggling arms into Gaza via tunnels, and to make Gazan hospitals available to wounded ISIS fighters and commanders. Egypt has long suspected Gaza's Islamist rulers of being a steady source of weapons and volunteers for ISIS. Now, the ISIS-affiliated movement in and around Gaza is openly challenging Hamas's legitimacy. Ironically, Hamas does the same thing to the ruling Fatah movement in the West Bank, which it seeks to topple by provoking a large-scale Israeli military counter-terrorism operation, according to assessments by Israeli security sources. This deadly jihadist "game of thrones" looks set to continue and could act as a destabilizing factor and a catalyst for further attacks. The Israeli defense establishment sees the truck ramming as the work of a lone attacker – the hardest type to detect and thwart preemptively. While the Shin Bet domestic intelligence agency is making progress using big data analytics to scan social media accounts and pick out potential lone terrorists, much work remains to be done in this challenging field. Israeli Prime Minister Benjamin Netanyahu referred to this during remarks he made on the scene of the Jerusalem ramming, "I think the most important thing to understand is that we are under a new type of attack, by a lone terrorist, who becomes inspired and decides to spontaneously act." To counter ramming attacks, Israel has installed concrete barricades around bus stops in Jerusalem and the West Bank, he added. Additionally, Israeli security forces spent the past year intensively developing a "preventative intelligence infrastructure," Netanyahu said, in reference to data analytics. As the race continues to improve these techniques, Israel will need to continue to rely on the rapid responses of armed security forces and civilians who typically arrive at the scene of such incidents within seconds and open fire on terrorists. Whether it is organized large-scale cells or lone murderers, the threat of indiscriminate jihadist violence looks set to remain with Israelis for years to come – though as the past two years have shown, Western cities are also increasingly prone to such threats.